Rush-Co introduced Shelter-Rite 18 oz. fabric as the performance leading fabric to the Boat Lift Cover market nearly 15 years ago. The foundation of the 18 oz. vinyl coated fabric is a 5 ounce high-tenacity (strongest) polyester yarn. The top side and underside have 6.5 ounces of coating that provides superior tear resistance, ultra violet and anti-fungal protection, and water tightness. All seams are heat welded (not sewn). Shelter-Rite 18 oz. will not stretch, shrink or rot. An average cover weighs 65 lbs.. 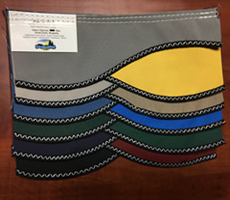 Note: Shelter-Rite® fabric is the most consistent in color year to year, roll to roll and cover to cover. Seaman Corporation uses computerized pigment formulation equipment that all but eliminates this issue. (Occasional sheen variation can create the appearance that colors vary ever so slightly.) Covers made of Shelter-Rite® are covered under the Rush-Co 7-year limited warranty. 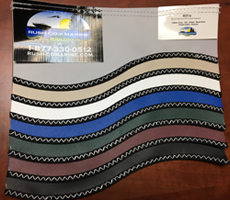 Rush-Co’s development team worked with Seaman Corporation engineers to design a new fabric specifically for Boat Lift Canopies. The foundation of this new LIGHTWEIGHT Shelter-Rite SLT13 is identical to the Shelter-Rite 18 oz. fabric except the underside coating was reformulated and reduced to 1.5 ounces. We are able to reduce the weight of the fabric while maintaining the same tear resistance, ultra violet and anti-fungal protection, and water tightness as SR18. All cross seams are heated welded (not sewn). SLT13 will not stretch, shrink or rot. An average cover weighs 47 pounds. 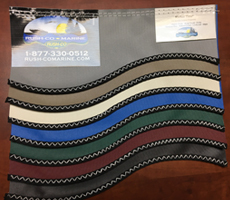 Rush-Co has had great success with Harbor-Time fabric in the Boat Lift cover market. It is made from acrylic-coated polyester and is ideal for harsh marine environments because it offers exceptional resistance to abrasion while maintaining superior strength and visual appeal. Your customers will get compliments on its cloth like appearance. 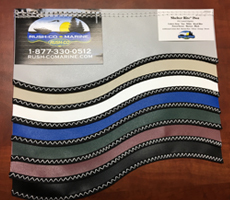 Harbor-Time is a highly water repellent cloth that is resistant to both mildew and ultraviolet light making it a durable choice for boat lift marine applications. Rush-Co has perfected heat welding Harbor-Time fabric seams (not sewn). An average cover weighs 42 lbs. Note: The Glen Raven Mills 5-year colorfast warranty applies to Harbor-Time™ fabric. The Rush-Co 5-year limited warranty applies to other product warranty situations applying to Harbor-Time. SeaMark is a durable combination of Sunbrella (woven acrylic uncoated fabric) and Haartz (a textured marine-grade vinyl coating) that results in a colorfast, waterproof fabric. SeaMark fabric has been engineered to stand up to moisture, sun, wind, and temperature extremes experienced with outdoor use. This vinyl-backed Sunbrella with sewn cross seams uses highly UV resistant industrial thread. The vinyl backing is color coordinated with the Sunbrella cloth top. SeaMark™ is a 15 oz. fabric. An average cover weighs 54 lbs. Note: Please call for SeaMark™ canopy lead times; these lead times may vary from our standard 5-7 day lead time due to raw material inventory. 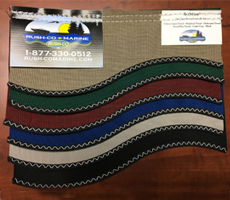 WeatherMAX, with its solution-dyed yarns, is designed to be water-tight and breathable. Our exclusive HydoMax TM finish delivers unsurpassed water repellency and mildew resistance maintaining the fabric’s natural breathability. Engineered for long-term color and strength retention, Weathermax outperforms and outlasts other marine fabrics including acrylics and solution-dyed polyesters. This lightweight, easy-to-handle fabric is unmatched in appearance and provides superior performance. **Weathermax is water-repellant, not waterproof. Under heavy periods of wind-driven rain, storms, etc. Weathermax may experience water being pushed thru the fibers/material and you may experience some water seepage.